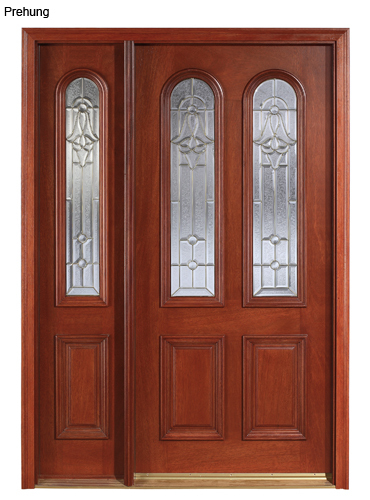 We currently offer three collections of 100% solid wood entry doors: ”Mahogany Type Collection”, ”American Red Oak Collection” and ”Rustic Mahogany Type Collection”, with matching solid wood sidelites and jamb sets, all pre-hung’s including a set of exterior brickmould and interior casing. We do not use any veneers or engineered stiles and rails in our products, eliminating the possibiity of peeling or delamination. All exterior solid wood doors are handcrafted to your exact size. Wood has traditionally been the top door choice of homeowners because of the number of styles and species available. 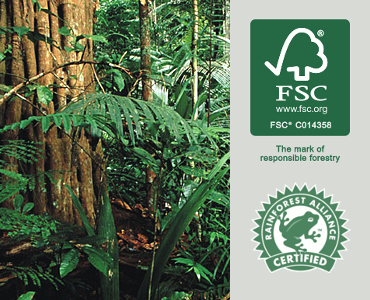 Main Door is certified for chain of custody by Rainforest Alliance (SW-COC-000491) in accordance with the Principles and Criteria of the Forest Stewardship Council™. 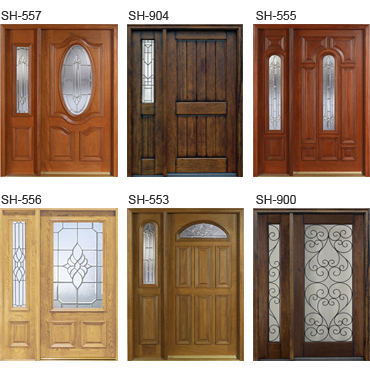 Our product line of solid wood doors, sidelights and jamb sets is manufactured and shipped open for glass from our own state of the art factory in South America. South American Mahogany type wood (Cedrelinga catenaeformis Ducke)) is one of the most prestigious hardwoods. 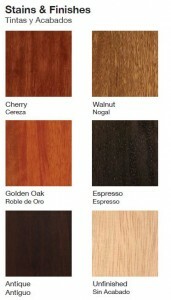 Its brownish natural color and rich grain enables one to achieve a finish which will add warmth & ambience to any room. 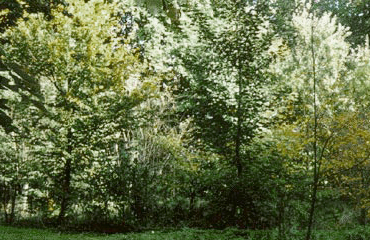 Northern American Red Oak (Quercus rubra) with natural variations in color and grain has a very robust grain. Being a dense hardwood, red oak proves to have excellent durability against the elements. four standard finish colors for the American Red Oak Collection -Natural, Red Oak, Light Walnut and Dark Walnut-, and a one standard “rustic distress” finish for the Rustic Mahogany Collection. Only the “rustic distress” finish is offered for the Rustic Mahogany Collection to give the appearance of an antique or of heavy prior use. The doors are intentionally distressed for an older look as though they’ve been around for a long time, with a surface texture and patina, i.e. scratches, holes and dings. 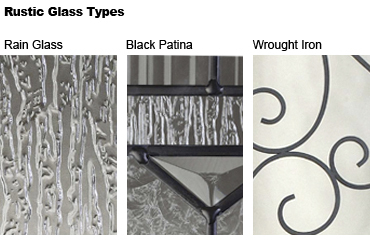 For the MAHOGANY TYPE COLLECTION and AMERICAN RED OAK COLLECTION, we offer two glass options, A & B, with three caming options: Brass, Black Patina and Zinc. 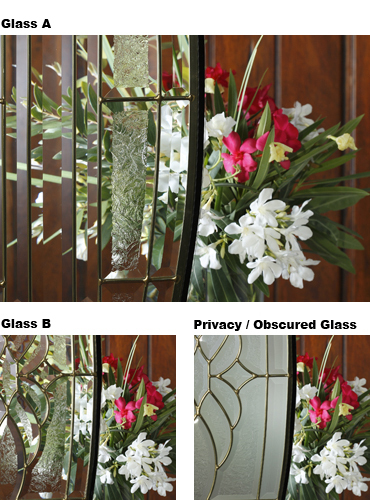 The 5/8″ thick glass panels are triple glazed insulated, with clear or obscure tempered glass inside and clear tempered glass outside and, between the tempered glass, the decorative hand assembled cluster beveled glass panel, glue-chip and water glass, using metal caming (brass, black patina or Zinc), creating a striking effect as well as blocking the view without blocking out light. The standard clear tempered glass allows some visibility with only the decorative beveled glass panel, glue-chip and water glass limiting the visibility. The obscure tempered glass inside option provides a high degree of obscurity. 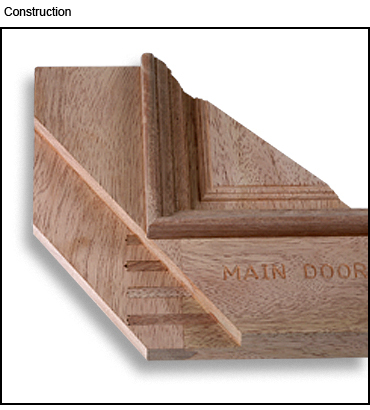 All pre-hung units have a choice of a solid oak sill, unfinished or finished, or an oak adjustable aluminum sill (threshold) and door shoe, finished in brass, bronze or satin nickel to match the glass caming. 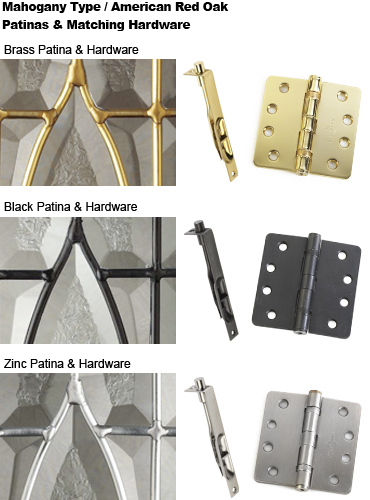 All pre-hung units are furnished with rust resistance ¼” radius corner 4″ x 4″ ball bearing hinges in bright brass, antique oil rubbed bronze or satin nickel finish to match the pre-hung hardware. Doors 80 inches in height with three hinges and 96 inches in height with four hinges. Old World craftsmanship with state-of-the-art computerized woodworking makes our rustic doors the best value on the market. Our rigid adherence to the art of hand crafted and hand assembled doors, glass inserts, and rustic hardware keeps us true to time honored traditions. Our popular Rustic collection will enhance your home at a very attractive price point. 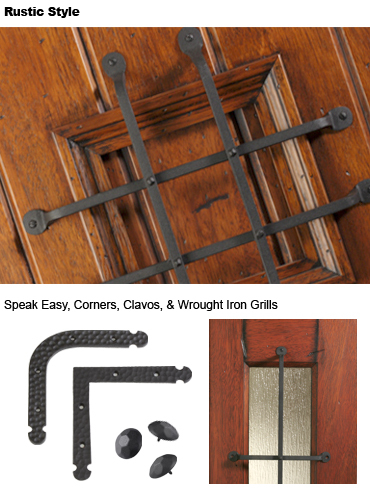 Our doors are available with an operable speakeasy opening mounted in the doors, including the wrought iron grill, hinges, lockset, screws, solid wood speakeasy door and weather-stripping. This is an actual inner door that may be opened or closed, mounted in the upper panel of the doors. Our doors are available with round antique style clavos fixed securely on one or both sides of the doors in powder coated satin black. All exterior pre-hung entrance units are custom build to exact net sizes and come standard with jambs made from the same wood species as the door. Doors are pre-hung to customer inswing or outswing requirements. The most popular standard size, 36″ x 80″ x 1 ¾”, is available in all three collections. There are also selected models available in 30″ & 32″ x 80″, 42″ x 80″ and 36″ x 96″ in the MAHOGANY TYPE COLLECTION and AMERICAN RED OAK COLLECTION. This allow us to accommodate most entryway configurations. 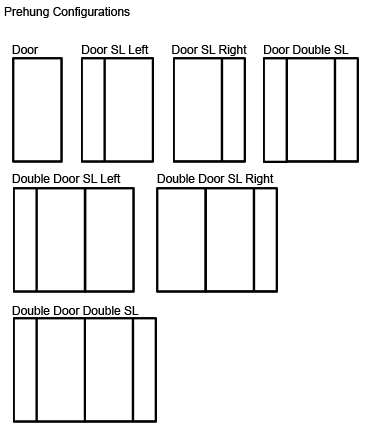 Rectangle Transoms – Matching rectangle transoms for above the entry door in a variety of widths and heights. Operable Sidelite – With attached T-Astragal and flush bolts to operate as a double door unit. Venting sidelites – The sidelite opens as a window (no screens) installed on one or both sides of the entry door. Provided with hinges and thumb turns. Our prices include same wood 2-1/2″ 711 interior casing and 2-¼” exterior brickmould or stucco mould, unfinished or finished. Hinges: 4″ x 4″ ball bearing, ¼ round corners for 1 ¾” thick doors in bright brass, bronze and satin nickel. As with our product we take pride in our shipping, packaging and crating methods. We go through great lengths in the shipping & crating process to ensure that your investment is delivered safely. Each year, less than 1% of our shipped product reaches its destination with damage. Immediately upon receipt of the order The Home Depot must completely inspect all products for defectives or damage. Discovered damage and or defectives must be immediately noted on the bill of lading in the presence of the carrier. Failure to do so will release Main Door Corporation from any liability. In the case of damage, it is The Home Depot responsibility to retain all packaging and shipping materials and return the shipment in the same condition in which it was received. Our lead time for a pre-hung & unfinished unit is 15 days and for a pre-hung & pre-finished unit is 21 days. 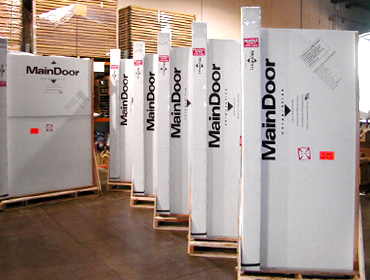 Main Door Corp. warranties its products against manufacturing defects for a period of one year from date of shipment to the retailer. It is important that the customer, contractor, architect, installer, and finisher follow warranty requirements and conditions for warranty to be in effect. For a full copy of our Limited Warranty click on the link below. At Main Door we want you to be Satisfied with your purchase. To ensure this please review all the additional information on installation, finishing, trouble shooting, and care and maintenance located along with our Warranty. Just click on the link below.